Japanese technology satellite. Monitored H-2 launch vehicle performance. National name MYOJO. Technology satellite for NASDA, Japan. Launched 1994. AKA: Myojo;Vehicle Evaluation Payload. Status: Operational 1994. First Launch: 1994-02-03. Last Launch: 2001-08-29. Number: 2 . Gross mass: 2,391 kg (5,271 lb). Provided a ranging function as well as functions to measure the acceleration and deformation, in order to confirm the accuracy of the H-2 rocket orbit injection and understand the environment of the payload equipment. Launching organization NASDA. 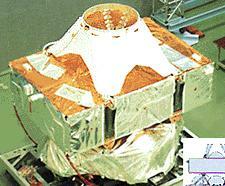 VEP 2 Technology satellite for NASDA, Japan. Launched 2001. 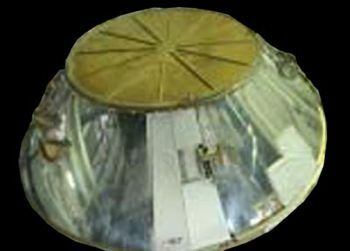 VEP 3 Technology satellite operated by NASDA, Japan. Launched 2002. Family: Geosynchronous orbit, Technology, Technology satellite. Country: Japan. Launch Vehicles: H-II, H-IIA, H-IIA 202. Launch Sites: Tanegashima, Tanegashima Y. Bibliography: 2, 279, 296, 552, 554, 6, 11956, 13341, 13342. 1994 February 3 - . 22:20 GMT - . Launch Site: Tanegashima. Launch Complex: Tanegashima Y. LV Family: H-2. Launch Vehicle: H-II. VEP - . Payload: Myojo / LAPS. Mass: 2,391 kg (5,271 lb). Nation: Japan. Agency: NASDA. Class: Technology. Type: Navigation technology satellite. Spacecraft: VEP. USAF Sat Cat: 22979 . COSPAR: 1994-007B. Apogee: 36,261 km (22,531 mi). Perigee: 449 km (278 mi). Inclination: 28.60 deg. Period: 645.00 min. Vehicle Evaluation Payload; monitored H-2 performance. Vehicle Evaluation Payload (VEP) MYOJO. Provides a ranging function as well as functions to measure the acceleration and deformation, in order to confirm the accuracy of the H-II rocket orbit injection and understand the environment of the payload equipme nt. Launch vehicle H-II rocket test flight H-II 1F. Launching organization NASDA. Launch time 2220:00 UT. 2001 August 29 - . 07:00 GMT - . Launch Site: Tanegashima. Launch Complex: Tanegashima Y. LV Family: H-2. Launch Vehicle: H-IIA 202. VEP-2 - . Mass: 3,500 kg (7,700 lb). Nation: Japan. Agency: NASDA. Class: Technology. Type: Navigation technology satellite. Spacecraft: VEP. USAF Sat Cat: 26899 . COSPAR: 2001-038B. Apogee: 35,979 km (22,356 mi). Perigee: 291 km (180 mi). Inclination: 28.60 deg. Period: 636.60 min. Vehicle Evaluation Payload-2 consisted of ballast and monitoring instrumentation that remained attached to the launch vehicle's second stage. It included a Doppler ranging experiment for orbit determination..